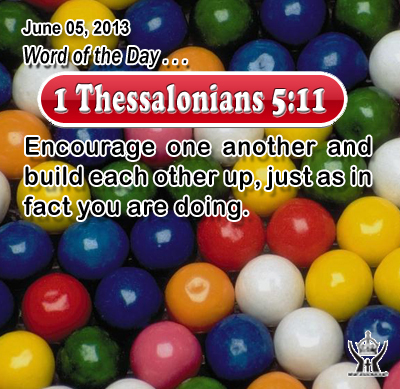 1 Thessalonians 5:11Encourage one another and build each other up, just as in fact you are doing. Heavenly Father, thank you for noticing and keeping evidence of the things we've done that are good and pleasing to you. Please help us to keep doing those things that please you, only better, that you may be pleased and glorified. In Infant Jesus name. Amen. 18And Sadducees came to him, who say that there is no resurrection; and they asked him a question, saying, 19 "Teacher, Moses wrote for us that if a man's brother dies and leaves a wife, but leaves no child, the man must take the wife, and raise up children for his brother. 20 There were seven brothers; the first took a wife, and when he died left no children; 21 and the second took her, and died, leaving no children; and the third likewise; 22 and the seven left no children. Last of all the woman also died. 23 In the resurrection whose wife will she be? For the seven had her as wife." 24 Jesus said to them, "Is not this why you are wrong, that you know neither the scriptures nor the power of God? 25 For when they rise from the dead, they neither marry nor are given in marriage, but are like angels in heaven. 26 And as for the dead being raised, have you not read in the book of Moses, in the passage about the bush, how God said to him, `I am the God of Abraham, and the God of Isaac, and the God of Jacob'? 27 He is not God of the dead, but of the living; you are quite wrong." Jesus responds to Sadducees argument by dealing with the fact of the resurrection and immortal life. Jesus demonstrates that God is a living God of a living people. The scriptures give proof of it. In Exodus, God calls himself the God of Abraham, the God of Isaac, and the God of Jacob. God was the friend of Abraham, Isaac, and Jacob when they lived on the ground. That friendship with God could not stop with death. David in the Psalms also speaks of the realism of immortal life with God. In Psalm we pray through the words of David: "I am repeatedly with you; you hold my right hand. You guide me with your counsel, and later you will receive me to glory." The Holy Spirit reveals to us the everlasting truths of God’s unending love and the life he desires to share with us for all eternity. Paul the Apostle, quoting from the prophet Isaiah states: “What no eye has seen, nor ear heard, nor the heart of man conceived, what God has ready for those who love him,” God has exposed to us through the Spirit. The promise of paradise - wonderful bliss and unending life with an all-loving God - is beyond human reckoning.